For this new season 2018/19, ICM is pleased to renew its partnership with Team Val’Eure Triathlon (TVT). Beyond the quest for performance, ICM, manufacturer of special-purpose machines, and the TVT continue to gather around common values like versatility, dynamism and perseverance. The last season was marked by the confirmation of great results, but also the arrival of +40 licensees, showing the rise of this sport in France. 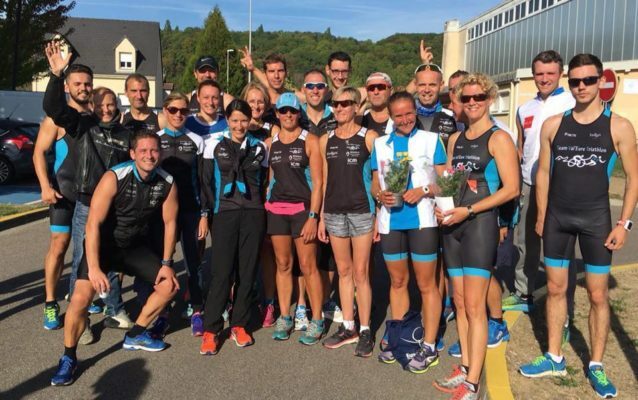 The TVT women’s team participated for the first time at the highest level in French duathlon. On the men’s side, the Duathlon Grand Prix team, running in division 3, gave their best to try to climb to the next level of this French championship. They narrowly missed the qualification at the national grand prix final. Jacky Buron confirms his past performances, gaining again the 2 titles of world champion V5 duathlon (short and long distance). Finally, the goal of any triathlete is to make one day in his life an ironman: this year the club is proud to count 3 finishers. For almost 25 years, ICM has been designing and manufacturing bespoke, high-speed, special-purpose machines in particular for the cosmetics, pharmaceutical and medical industries. ICM’s expertise comprises assembly machines, feeding systems (vibratory bowls, tracks / conveyors and hoppers) and the integration of industrial vision and robotics systems. Counting more than 100 licensees to date, the TVT is with 30% one of the triathlon clubs with the highest rate of women in Normandy’s department Eure. The members of the TVT participated in about sixty regional and national competitions totaling 68,500km traveled (Gaillon round-trip distance – venue of the competitions).